Comments Off on SALE APRIL 26-28! FRI. – SUN. APRIL 26TH– 28TH! CHECK OUT OUR CLEARANCE TABLES ! 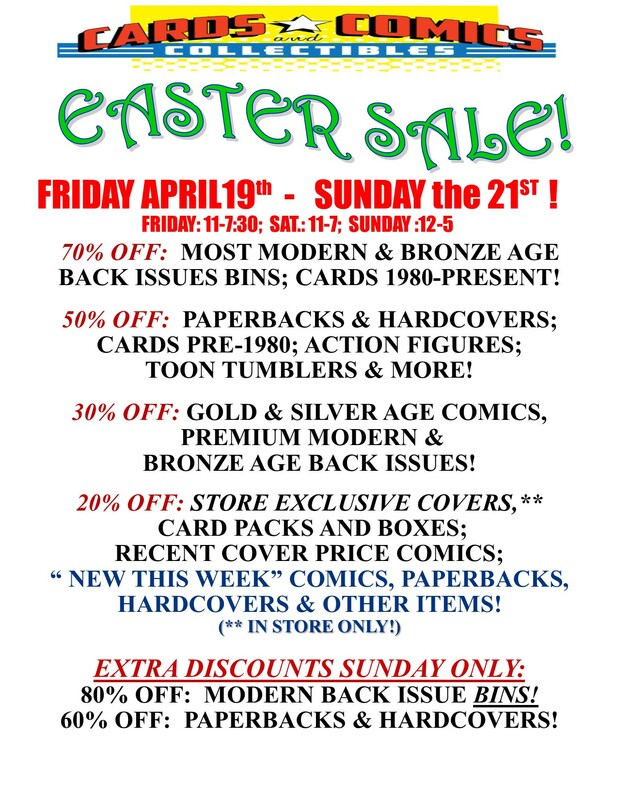 Comments Off on EASTER SALE! 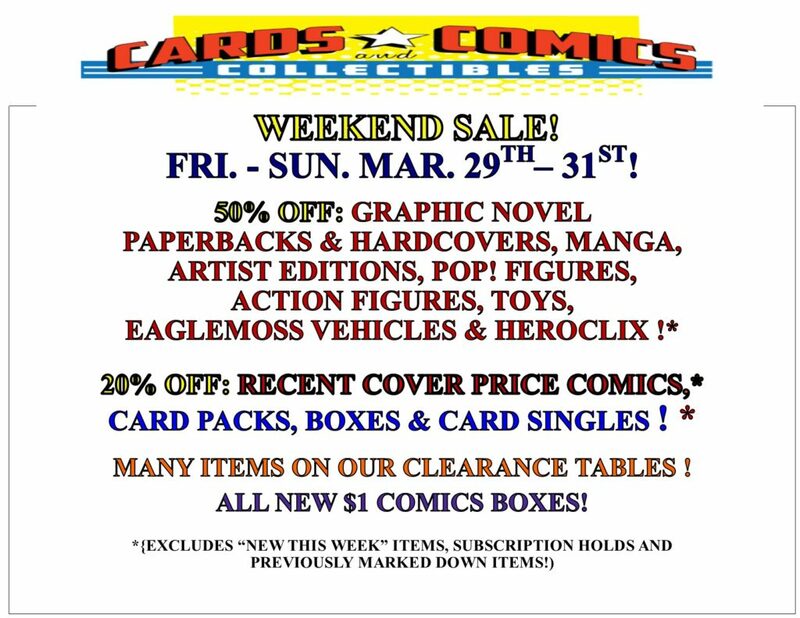 FRIDAY APRIL19th – SUNDAY the 21ST ! POP! 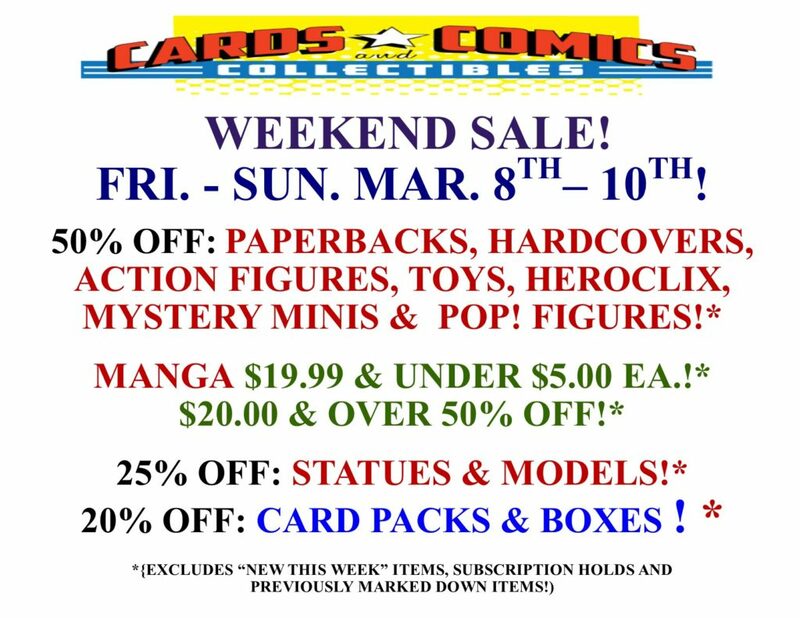 FIGURES: STATUES & MORE! 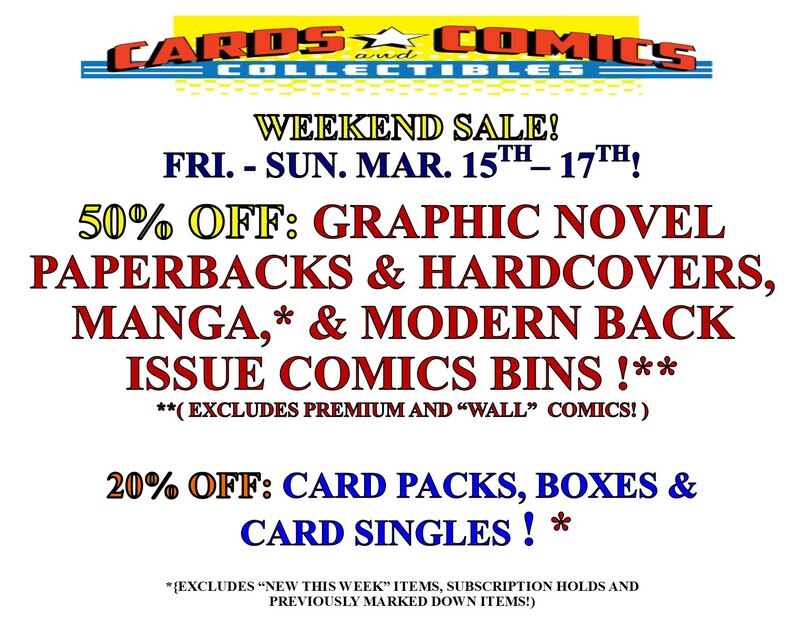 60% OFF: PAPERBACKS & HARDCOVERS! Comments Off on SALE APRIL 5-7! FRI. – SUN. 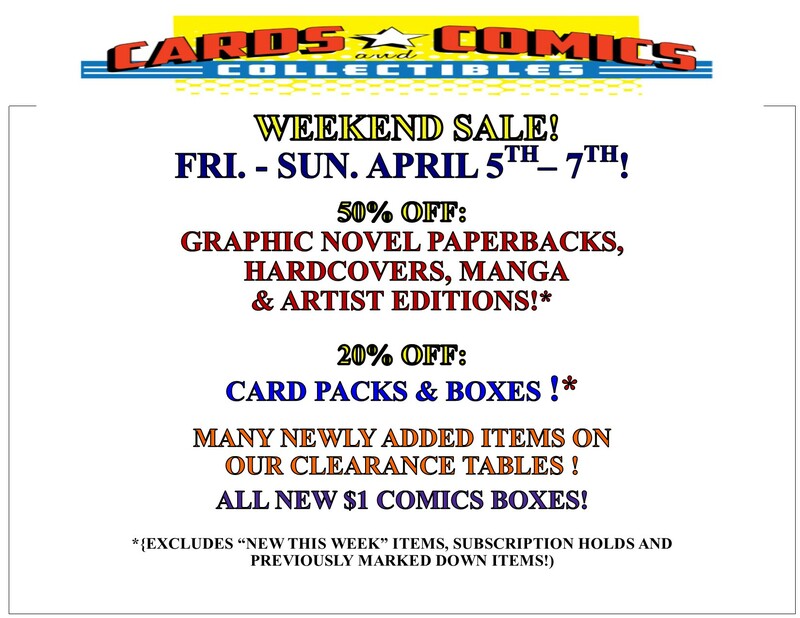 APRIL 5TH– 7TH! 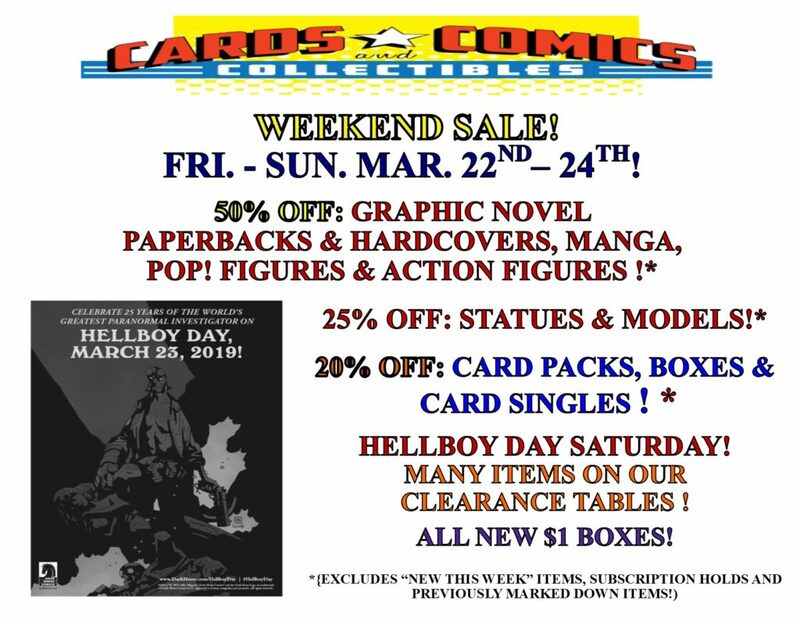 Comments Off on HELLBOY DAY AND SALE! FRI. – SUN. MAR. 22ND– 24TH! 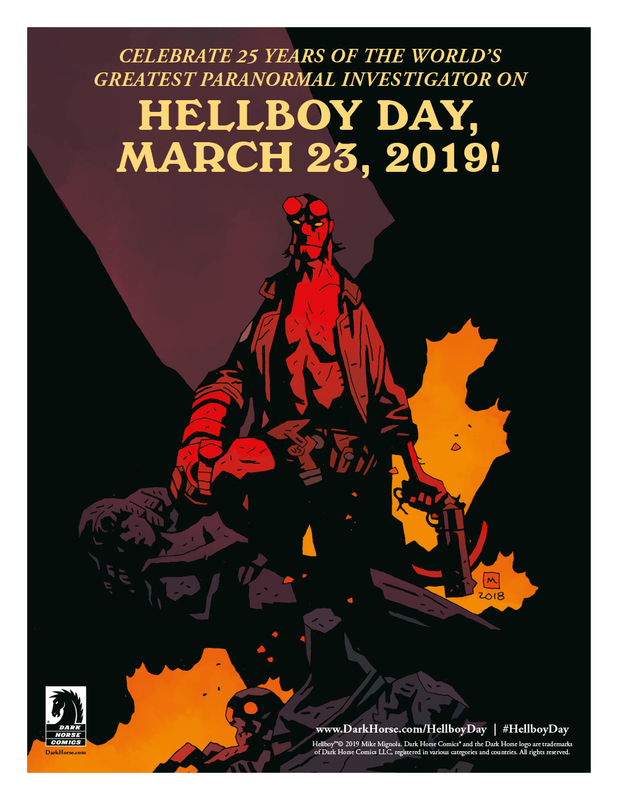 FREE HELLBOY COMIC WITH PURCHASE! PLUS OTHER GIVE-A-WAY GOODIES! Comments Off on SALE! 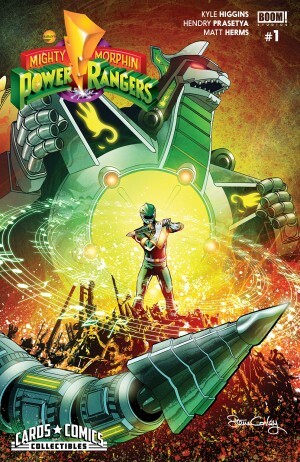 MARCH 15-17! FRI. – SUN. MAR. 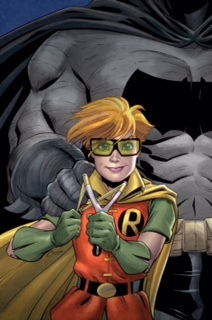 15TH– 17TH! Comments Off on SALE MARCH 8-10! FRI. – SUN. MAR. 8TH– 10TH! 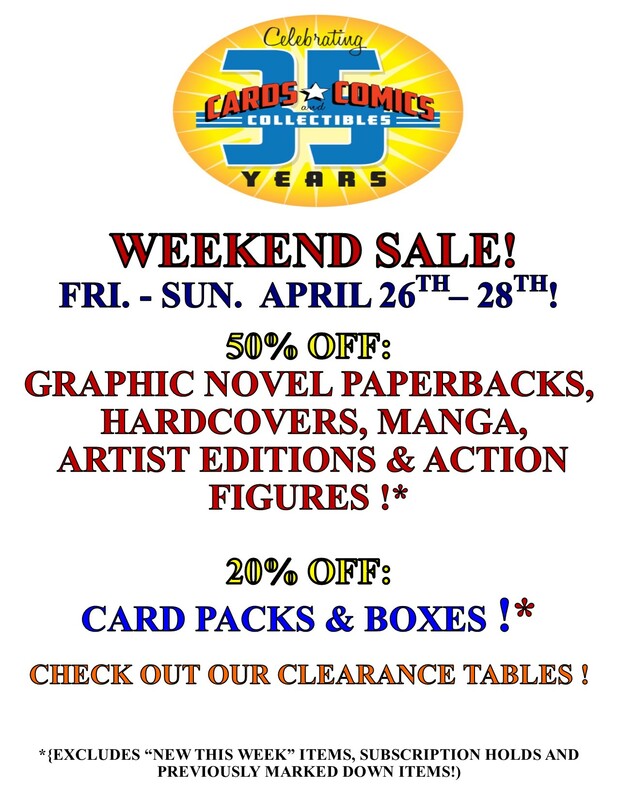 BE SURE TO CHECK OUT OUR CLEARANCE TABLES WHEN YOU COME IN! Comments Off on WEEKEND SALE! MAR. 1-3! FRI. – SUN. MAR. 1ST- 3RD! 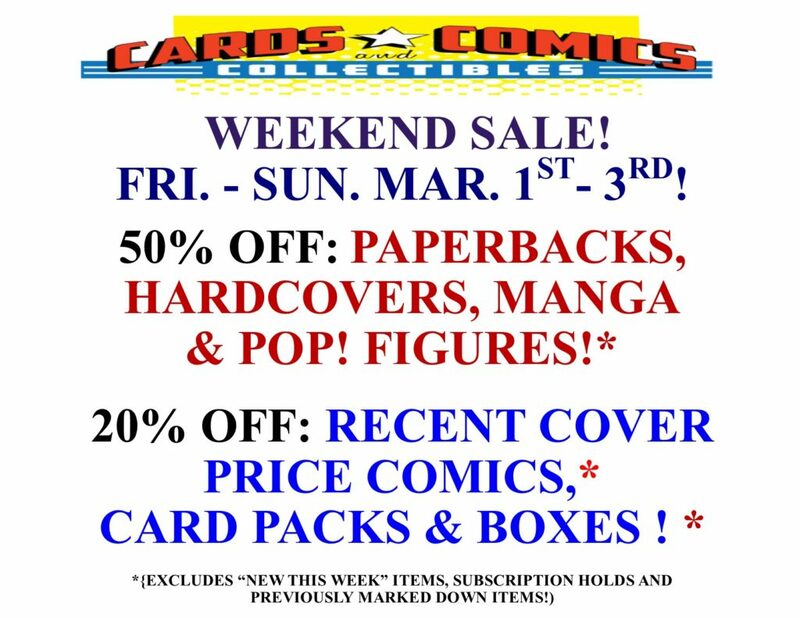 WEEKEND SALE FEB. 23 & 24! 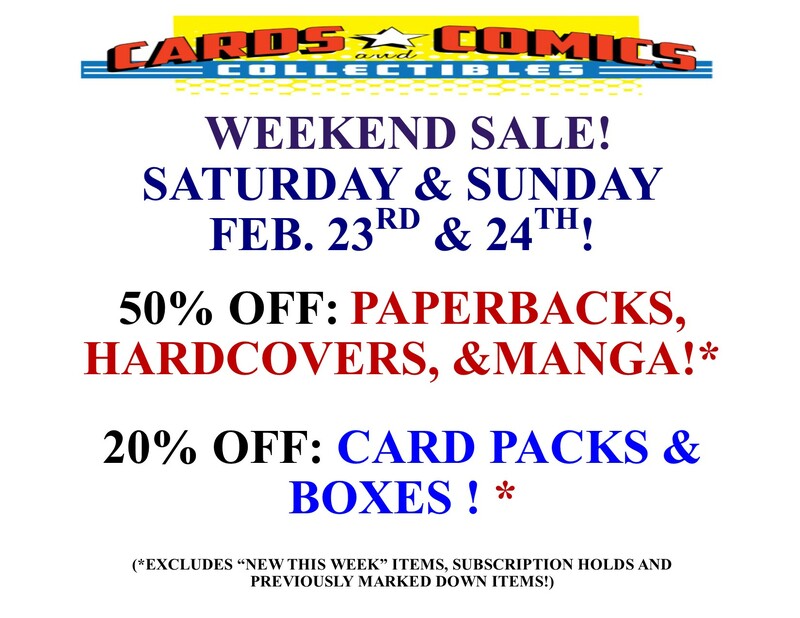 Comments Off on WEEKEND SALE FEB. 23 & 24! Comments Off on President’s weekend sale! 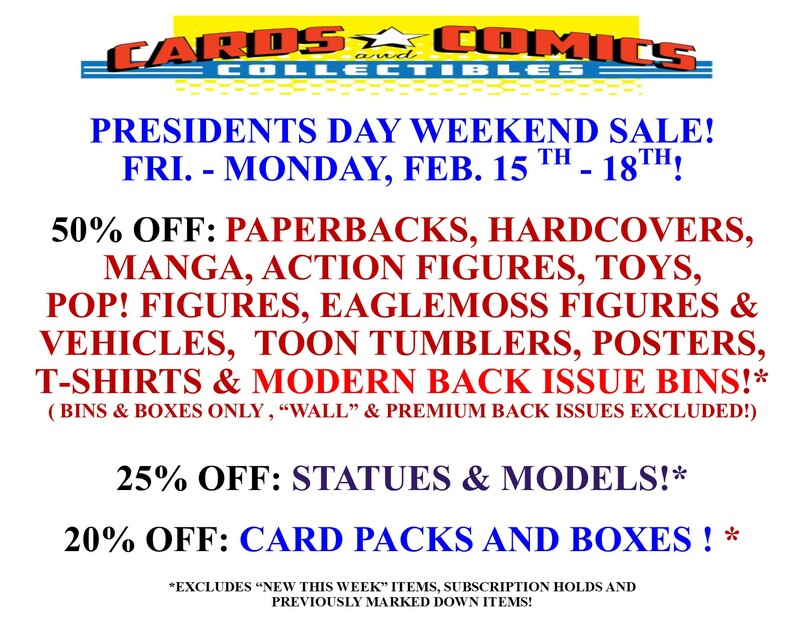 FRI. – MONDAY, FEB. 15 TH – 18TH!